"I can't thank you enough for what you have created at Vine. I am overjoyed to provide my children with the opportunity to be a part of this microcosm of kind, inquisitive, creative and hard working kids. What a beautiful thing you have done." "Vine offers every child a tailored and highly effective educational experience, and my two daughters are thriving there as a result. The curriculum has been meticulously crafted, a product of rigorous thought that is also adaptable to students' needs and interests. Accompanying the robust curriculum are regular assessments that fit curricular goals and are clearly communicated to parents. My daughters love being at school, because the work engages them, the teachers are creative and knowledgeable, and the environment is inclusive and supportive. Vine is a gem, education at its best." "I cannot say enough about Vine Academy! The teachers are wonderful, the other students are so inviting and the curriculum is superb! After the first day of my son shadowing, he absolutely loved the school and requested to be transferred the next day. The best decision we could of made for our son and our entire family!! It is truly a family at Vine Academy." "I am a parent of a former student who attended Vine Academy from 5th-8th grade. It was without a doubt the best educational decision that we ever made for our daughter. Her entire experience at Vine was healthy, positive, supportive and uplifting. She was always challenged and engaged. I credit them for helping to create an eager and enthusiastic learner. We are extremely happy with the quality of our daughter's education at Vine Academy. As an 8th grader at Vine, our daughter tested into all honors classes at Hinsdale Central for her freshman year, including three sophomore level honors classes. Thus far she has excelled in high school academically and socially. She made an effortless transition from middle school to high school. She made the Dean's List Honor Roll, is a member of the school cheerleading squad, as well as active in several other clubs in school. Vine Academy's transition program for recent graduates moving into high school really helps graduates anchor good study habits and apply what they learned to the high school setting. The Vine Academy teachers are committed to the students in a way that is unparalleled." "My heart is filled with such gratitude and joy to let you all know that our son is thriving in High School. He is completely embracing his freshman year at St. Francis... Along with writing, Vine has prepared him for everything. He is managing his time, preparing in advance, staying organized and most importantly enjoying learning. As impressed as I am with his grades, I am really more excited with his enthusiasm... I now know that his future will be whatever he wants it to be. I will be eternally grateful to every one of you for your love, support and confidence in him. You are changing kids lives for the better." "Vine Academy has been the perfect fit for our family. We have been so thankful for the over-and-above dedication of the entire staff. They truly care about all aspects of learning and development and are able to bring out the best in all students." "I wanted to take a moment to reach out and let you know how impressed I was with the kids and staff on the field trip. I was truly overwhelmed with what I experienced. There were several students holding hands, including boys, which made my heart smile. I never would have witnessed this public display of care and kindness in our previous environment. I saw several students looking out for one another when crossing streets and at mealtime. The students were engaged in the tour, answered and asked questions as well as showed respect in the temple. At ComEd there were a few students who really stood out in their ability to critically think and problem solve. I heard comments that were wonderfully forward thinking and were light years above that which I would expect. At one point in the car on the way back to Vine you could hear a PIN DROP because they were ALL READING. I witnessed the educators be strong leaders with high expectations, firm yet kind. There was a student who didn't feel well and she was treated in such a "motherly" way, exactly how I would hope my children would be treated in the same situation." "My daughter spent 4 years at Vine Academy and it was without question the smartest choice we could have made for her. Vine offered my daughter a customized learning plan that not only helped bring her up to grade level in classes she was struggling in, but also set her up for continued success in high school now that she has graduated from Vine. My daughter went to school each day with a smile on her face, knowing that she would be respected by her teachers and peers and treated as an integral member of the school. She is now a straight A student at her new school." "Vine Academy has truly changed our lives for the better. I wish I could say enough about the teachers, the format of learning, and the atmosphere they have created. We love this school and have had the pleasure of seeing many friends try the school out for themselves only to join this community right away. Grateful for such a special place." "All three of my children have attended Vine. 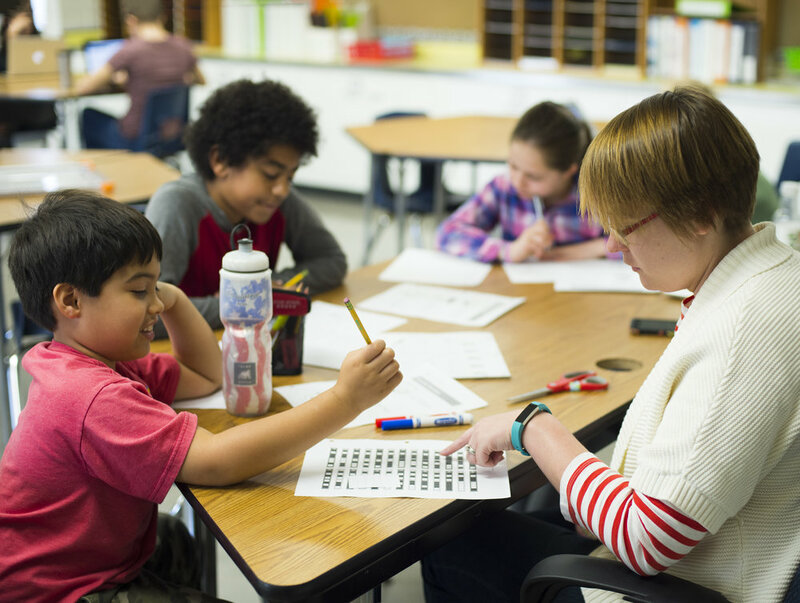 It is a tremendous opportunity for students to receive focused, individualized attention. We have great public schools in the area, but with the large class sizes it's difficult for teachers to adjust curriculum to each student's specific needs. At Vine, students are taught at a level that challenges them, regardless of age or grade. My daughter is technically a 3rd grader, but is doing 5th grade math because that's where she needs to be right now. When my son struggled with Spanish, he didn't move forward until he'd mastered the content. At a public school that wouldn't have been possible. Vine's individualized curricula allows kids to be taught at whatever level they're at for each subject at any given time, while still spending their day with kids in their own age group." "Vine Academy has been an excellent experience for my two sons. I have been extremely impressed with the individual attention and customized instruction that these teachers have been able to provide. It's a very flexible combination of academic challenge and personal encouragement and support." "Vine Academy is amazing. The staff at Vine has given our son the challenge and support he’s needed to finally thrive at school... and he loves learning again! As a former teacher, it’s clear that Vine is doing everything right. Their small group / large group model is the answer we'd been looking for. After seeing what it's done for our son, we made the decision to transfer our other two children to the school too. At this point, no other school could come close to offering the high standard of instruction we’ve come to expect at Vine Academy. Couldn't be happier!"